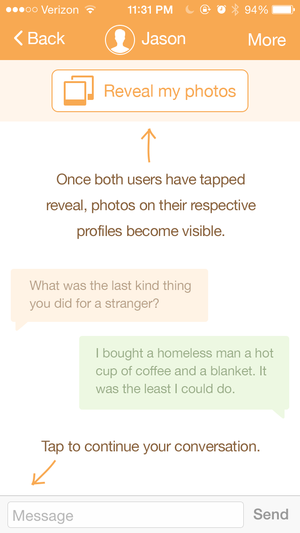 For better or worse, Tinder and its clones have changed the way people date. But swiping through photos to find the hottest nearby hook-up partner isn’t for everyone. Willow launches Wednesday in the App Store to give you another, less superficial way to meet people. Unlike Tinder, Willow encourages people to talk before they share photos. You can set a geolocation filter to answer questions only from people in your area, or you can chat with anyone in the world. Pick a category of questions you’re interested in answering or just pick a question at random. The app’s goal, said founder Michael Bruch, is to give strangers a new way to connect, whether for romance, friendship, or just as a fun way to pass the time. Once you determine that the person you’re chatting with is worth a little more effort, you can choose to “reveal” your photo and proceed from there. Willow will soon add photo, video, and voice messaging to make chats a little more interesting, and an Android version of the app is on the way. And if you’re not on the market, you can still browse through some of the app’s more bizarre questions without asking any yourself.